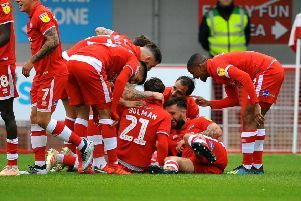 Crawley Town head coach Gabriele Cioffi was left 'very, very frustrated' after his side were beaten 3-0 by Oldham Athletic at The People's Pension Stadium. Three goals in the last 16 minutes condemned the Reds to a heavy home defeat but wasted chances cost Cioffi's men dear. And the Italian believes those chances should have won his side the game. Her said: "I am very disappointed. We had the chances to win and we lost so that’s how I feel. The first goal changed the game. "I can’t say the boys didn’t go onto the pitch with the right mentality, they did. In terms of mentality it was good in terms of result it was not and I am not pleased at all. "We created chances but could not score and that cost us." The deadlock was broken after a brilliant free kick from Johan Branger-Engone before two goals on the counter attack finished off the scoring. But if Ollie Palmer's gilt-edge chance at 0-0 had gone it, it could have been a completely different story. Cioffi said: "They came here for one point we had four or five chances to score and we didn’t. In the previous game Ashley [Nathaniel-George] changed the game, in this game he didn’t. "Matty [Willock] made his debut - I am sorry for him but he had an ok performance." Cioffi added: "They broke the balance of the game with the free kick and then it became an open game. I am very, very frustrated."